Madness has a new single out! Released on their own label, Lucky Seven Records. The new song is called “Sorry,” and the even better news is that there’s a full album on the way this summer. Amazon has the CD single with four versions of the song available now. I’m pretty sure their most recent album before this was Wonderful, from 1999. Which I thought was â€” you know where I’m going with this â€” wonderful. Here’s the video for “Sorry.” God, I love these guys. Talk about aging gracefully and in style. It makes me so happy that they’re still making music. 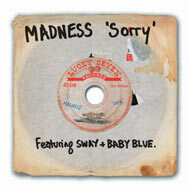 • Here’s an alternate version of “Sorry” featuring two UK hip hop stars, Sway and Baby Blue. • And a backstage message from Suggs! • There’s more video and info on the official Madness MySpace page. • The official Madness site: still the most fun and best-designed Web site for a band I’ve ever seen. You could spend hours just playing with it. Each album gets its own mod little room â€” and when they say don’t touch the cat, they mean it. Aging gracefully…yes! Most bands would be lucky to write one pop song as solid and charmingly strong as Lovestruck. To do it on their “comeback” album 20 odd years after they first got together really says alot about their talent.